Finally, after much procrastination to do with the dreadful weather, the naughtiness of kittens, the indecisions born of uncertainty about when I'll be able to get to France next, I've started the first seeds of the new season. 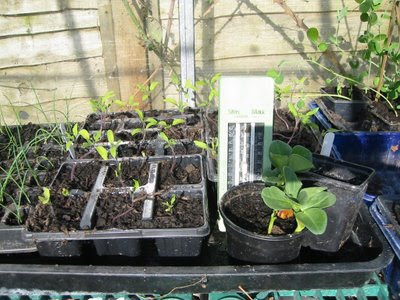 This picture is a bit of a con, it's seedlings from last April but I thought a picture of small pots of mud would be even less interesting. I did buy myself some windowsill propagation kit, a long deep tray, three seed trays and lids so that there is some chance of keeping the plants and the cats separated, but even that isn't so exciting and would merely function as advertising for Sankey so I've given it a miss. What did I plant? Onion Ailsa Craig, which should really have been started last month. Green Globe artichokes, lettuce Marvel of Four Seasons which I hope to have suitably modularised in time for an early plant out in April. Chilli pepper Trifetti from the Heritage Seed library and some rather hopeful Aubergines. We might get a good summer, please? The most interesting seed I started today was something that came to me via the Seed Exchange; Lathyrus tuberosus. I'd never heard of this, actually believing all sweet peas and their relatives to be horribly poisonous but it seems this produces edible tubers and is hardy in Europe. There is next to nothing about it on the web, most hits returning the same scanty information and clearly copied around willy nilly. This site seems authoritative but is still short on detail. I'm going to have to resort to reading my books it seems. Poor me. If they germinate I'll document them as they grow, which might be helpful to someone in the future. Anyway, now I'm started I'd better not stop until I've finished. I would have started some tomatoes but I've lost the seeds. Sound familiar? I would love to try growing some of your ulloco tubers if you have any left. My email address is trist1@phreaker.net. I have some elephant garlic if you would like to swop?